The We Both Read audio books are particularly helpful to use with the corresponding printed books in the classroom. They are also very effective for use with ELL/ESL students. 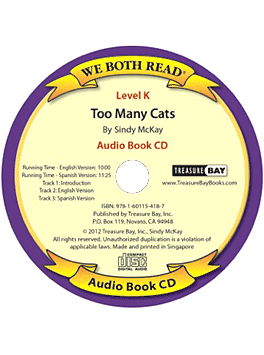 Too Many Cats / Demasiados Gatos is a bilingual title (Spanish / English) which focuses on reading the names for colors and the numbers from one to ten. Suzu is finding cats all over the house – and in very unusual colors! This Level K book is designed for the child who is just being introduced to reading. How Many? / Cuantos hay?